After working on two of the world's heavy-ion colliders, Satogata brings his life experiences and tireless passion for science to students and accelerators. When Todd Satogata was seven years old, he sat outside on a hill, side by side with his mother looking up at the stars. With a natural curiosity for the goings-on of the universe, and a mind inclined toward math and science, Satogata recalls a childhood full of watching the television series Nova, reading Scientific American, and playing with logic puzzles while growing up in Cincinnati, Ohio. He dreamt of becoming anything from an airline pilot to a magician (but he would’ve been happy with becoming a puzzler like Martin Gardner, too). He had yet to discover accelerator physics. “I didn’t know accelerator physics was a job,” he said. Satogata attended the University of Cincinnati to pursue a degree in math, when he came to a life-altering realization. “I started to realize: I love math, but I could also tell that if I did only that, I’d be disconnected from hands-on applications more than I liked,” he said. The son of an intellectual Swede and a Japanese artist born in Hawaii, Satogata was wired from an early age to be service-oriented and care about his impact on the community. This led him to add physics as a second major. After his first physics class, Satogata was intrigued, and it wasn’t long before he was pursuing graduate studies at Northwestern University, where he was engaged in the experimental exploration of nonlinear dynamics of particle motion at Fermilab’s Tevatron. After completing his Ph.D., he began working on the design, construction, commissioning and operations of the Relativistic Heavy Ion Collider (RHIC) at Brookhaven National Lab. Before working with $600-million equipment, however, Satogata delivered what felt like 600 million pizzas as a high-energy theorist in graduate school, managing a pizza parlor while simultaneously figuring out radiative corrections for CP violation. Thousands of successful pizza deliveries later, Satogata worked in the control room, became a staff scientist, and taught students at Brookhaven. 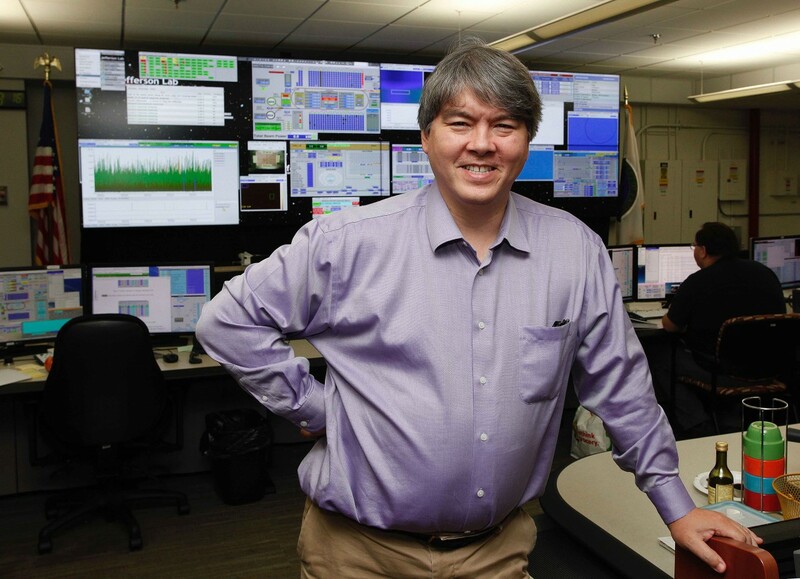 Then, in 2010, as Satogata was winding down his work on RHIC and the European Spallation Source, he received an opportunity to become involved at Jefferson Lab. “I assisted in the construction and evaluation of the new C100 cryomodules, participated in their commissioning, and acquired a joint appointment at Old Dominion University as a Jefferson Lab Professor,” Satogata explained. This continued to fulfill both his desire to be actively engaged in physics and to serve the next generation of physicists. It was also conveniently close to his fiancée, and now wife. Today, Satogata is a senior staff scientist in the Accelerator Division and is involved in designing, running and teaching the physics and operations of particle accelerators. He is now serving as director of the Center for the Advanced Studies of Accelerators. He said he enjoys getting into the office before everyone else and embracing the quiet while he reviews his to-do list that has six different sections. Those unknown lands hold the answers to questions that have deep implications: how stars live and die, how heavier elements arise, how the pieces of the nuclear puzzle all fit together. Along the way, the physicists and engineers working on these experiments develop technologies today that may change lives tomorrow: MRIs, PET isotope production, and particle radiotherapy for cancer treatments. “Some people ask what’s possible here; it may be simpler to answer, ‘What isn’t possible here?’” Satogata said, with a smile. For now, Satogata comes into the office early and full of hopes for the next generation of scientists and accelerators while being simultaneously ready to work with his team to mature the science necessary to make the next generation of an accelerator happen.